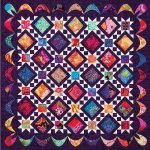 I made this quilt with Kaffe Fassett's fabrics. These fabrics are beautiful when cut up and put in a quilt. Although these fabrics are beautiful, just imagin this quilt made in other colors also. Instructions are clear and easy to understand. The border looks hard, but it is actually very easy. Spring is in the air and pretty soon the flowers will be blooming. Wouldn't this quilt make you feel happy! Tablecloth or throw: 54"x 54"
Twin size: 66" x 90"
Queen size: 90" x 102"